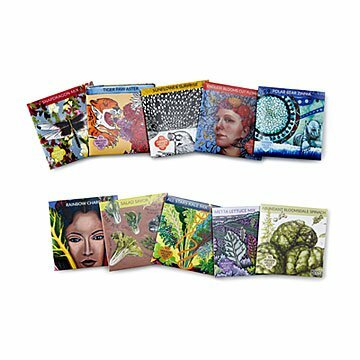 These artistically packaged heirloom seeds are bred by farmers and gardeners to have desirable traits. Each one of these seeds has a pretty special pedigree, yet they're all totally down to earth. Products of the growing "seed steward" movement, they're adapted to have the most desirable traits of each plant, like long-growing seasons and luscious blossoms. Plus the packages are literally works of art: Every year the seed-library-turned-seed-company issues a public call, choosing 20 artists to create new works for their new seed varieties. A thoughtful gift for both new and serious gardeners. Packages contain specific planting instructions for each variety. Choose between the Gourmet Greens (salad & greens) mix or Blossom Bouquet (cut flower mixes). Gourmet Greens: One pack each of Abundant Bloomsdale Spinach, All Stars Kale, Metta Lettuce Mix, Rainbow Chard, and Salad Savor Mix. Blossom Bouquet: One pack each of State Fair Zinnia, Endless Blooms Cut Flower Mix, Snapdragon Mix, Sunflower Surprise, and Tiger Paw Aster. Please Note: Polar Bear Zinnia has been replaced with State Fair Zinnia variety in the Blossom Bouquet Seed Collection. I've tagged this as a gift idea for others. My daughter is an artist, and loved the gorgeous packaging as well as the prospect of lovely flowers.